Description: CSX B778-02 works Blue Seal in Watertown with a former Conrail GP38-2. Description: Conrail SHared Assets local MA1 heads toward South Plainfield with a string of coil cars. Description: CSXT 2725 at the Mounfort Terminal in Erie, Pennsylvania. Photo taken from the deck of the barge PRESQUE ISLE that is undergoing dockside repairs at the facility. Description: CSXT 2725 sits with an SW1001 on the other end just east of Frontier Yard. Description: Camp Meeting Ave., 1640 hours. Description: A local sits parked on the MC tracks awaiting a crew. Description: WS4 has a cut of cars in tow for the Q161 as they pull onto the draw bridge for head room. Description: Only a year ago one could see NYS&W '60s era Geeps and now the engine terminal has been invaded by newer Geeps from the connecting roads. Description: What lovely weather to chase an SU99...here four units lug a long heavy train upgrade through Newfoundland. Description: With darkness setting in the SU99 is in dynamics as they go down Sparta Mountain. 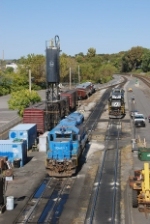 Description: A pair of former Conrail GP38-2s on lease to the NYS&W sit at the engine facility. Description: Three leased unit from Norfolk Southern and CSX sit at the engine facility with the NYS&W 206 and 510. Description: A look down at the NYS&W engine service area. Description: CSX general freight Q410 has just come off the high line and now comes upgrade at Zoo behind 3 YN2 units. Description: CSX manifest freight Q410 cruises eastbound through Zoo.